Jaxon Curtis Davin was born on April 11, 2013 at somewhere between 34 and 36 weeks gestation. He weighed a whopping 4 pounds 3 ounces. 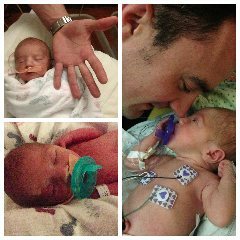 Jax was put in the NICU because of his size and his father and I were informed that he was otherwise perfect. On day 2 of Jax's life, we noticed something just wasn't right with his little eyes. An ophthalmologist examined Jax and we were told that he had bilateral corneal clouding. His right eye was completely clouded and his left eye was partially clouded. As first time parents, we were already nervous about taking home our new baby. With this new devastating news, our world was turned upside down. There are no words to describe the pain in our hearts and the pit in our stomachs. As we sat in Jax's room we could not help but ask why. So many questions ran through our minds. What caused this to happen? Would our baby ever see the world or our faces? 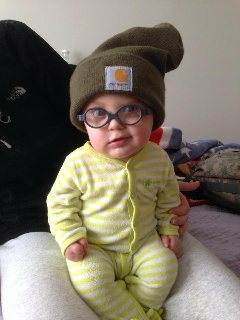 Would he be able to hunt with his daddy or ride a bike? Would he have to read braille or use a cane to navigate? Is there any other health issues that go along with this? Will he ever know what his mom and dad look like? Jaxon was born on a Thursday and we discovered the corneal opacity the following Saturday. The cornea doctor was not able to come in until Monday. We had no idea what was wrong or what needed to be done to help our little man. We had to wait two days to see the cornea specialist and they were the longest days of our lives. Many tears were shed and little sleep was had. How could we sleep with so little information? Whether the prognosis is good or bad, it is a huge relief to have some idea about what to expect. Knowing nothing is the worst. During that two-day wait, I did a lot of research to find information about what might cause an infant to be born with clouded corneas. This was a terrible idea and it definitely did not help my ability to sleep. On the other hand though, I did learn about the possibility of a cornea transplant. 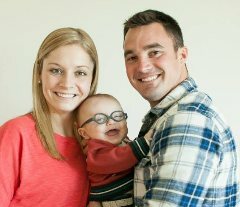 This gave me some hope for our little boy’s sight. That little hope helped me get through the next couple of days. On Monday, April 15th, the cornea doctor showed up around noon. He did the exam and we were told Jax could see very little, if anything at all. He also said we probably shouldn't do anything until Jax was about 6 months old. He walked out with his exam kit and we didn't see him again. My mom, Grandma Jackie, was there for the appointment and if you know her, you know that she is a do-er. Not a sit and wait-er. She is an RN/ successful businesswoman. She also took care of my sick father for many years. Sitting around and waiting was not an option for her. She knew the importance of a second-opinion because of everything she went through with my dad. After this devastating and terrifying exam, Jax's dad, Tyler, called his mom, Grandma Nancy and tearfully explained the situation. She works at the University of Iowa and has connections. The people she had connections with told her the names of those that could help with transferring Jax to the U of I quickly and smoothly. With this important information from Grandma Nancy, Grandma Jackie pulled aside Jax's neonatologist and said we needed to be transferred to the University of Iowa Children's Hospital and this is whom you need to talk to. Two hours later, Jax was in an ambulance heading to Iowa City and we were right behind them. 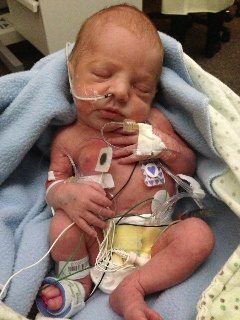 When Tyler and I arrived, we hurried up to the NICU and found a team of 10-20 doctors and nurses surrounding Jax's crib. This was the best sight in the world to a scared mom and dad needing answers. They did ultrasounds, flashed lights, started treatments and checked out this and that as we stood back watching nervously trying to catch pieces of the medical jargon that was being thrown around the room. The day before Jax was born, I had gotten a cold sore on my lip. I was on antibiotics but had to be very careful around Jax. It is the worst thing in the world to not be able to kiss your baby when you finally get to hold him in your arms. I wore a mask over my mouth just incase I couldn’t resist the temptation to kiss his baby lips. When we got to Iowa City, they weren’t going to take any chances. Every visitor and doctor had to put on what I called a “hazmat suit” before entering his room. They also started him on IV acyclovir while they tested his blood to see if I had given him the virus. This scared me half to death. I still had little information on what was wrong with Jax’s eyes so I started to think that if he did have the virus, it was all my fault that he couldn’t see. When the tests came back negative, I could finally breath again. The following few days were a blur as we learned more and more about Jax's eyes. We had visitors and doctors coming and going constantly. Geneticists were doing tests and everything kept coming back negative. This is a good thing, but, on the other hand, we didn't get the answers we wanted. 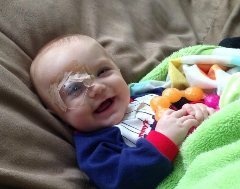 To make a plan of action, Jax's doctors needed to see the back of his eyes to make sure all of the major structures were fully developed and intact. They planned to do an ultrasound to see the back of his eye and gather this information. We were nervous as they set up the ultrasound machine at his crib side. The tech began the exam as the cornea specialist watched the screen from behind the crowd of nurses and techs. He explained what he was seeing as the ultrasound was going on. From what he saw, everything looked normal behind Jax’s eye. This was a huge relief, but because of the thickness of the clouding in the right eye, they couldn't see the major structures and they would have to do an exam under anesthesia. The risks of putting a baby of his size under anesthesia outweighed the benefits at this point, so we had to wait until he grew to do this exam. They also needed to see if Jax’s lens was attached to his cornea. 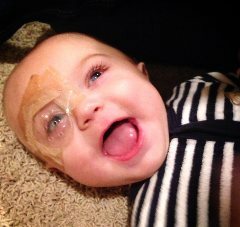 If it was attached, the cornea surgeon did not want to risk a transplant because he would have to remove Jax’s natural lens as well. If Jax lost his lens, he would need an artificial lens put in as well as a new cornea. The doctor believed this would make the chances of healing without transplant rejection more difficult. 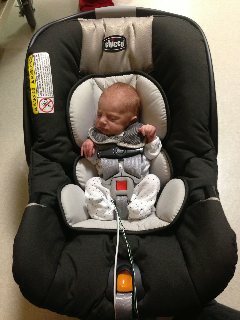 Jax was discharged from the hospital on April 28th at 17 days old. His condition still had no name and we still had little idea of what was going to happen next. We would find out more at the exam under anesthesia that was scheduled for July 5th. The two-month time period between discharge and that first EUA felt like forever, but we made an effort to treat Jax like a normal baby. We only shared our devastating news with those closest to us. We didn't know what it was or what would happen and we just weren't ready for all of the question we knew would come with telling everyone about Jax's eyes. During this time, we got started in the Early Access program, which meant a therapist would come to the house to evaluate Jax's progress and give us things to do to help him develop. 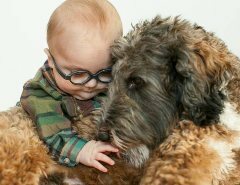 Visually impaired children tend to be developmentally delayed. This program also gets special needs kids ready for school when the time comes. Even though you can do very little with an infant this age, it felt good to have someone come teach you how to help your child develop. Those who know me personally know that it is not easy for me to share my emotions with others. I also prefer to keep a smile on my face and see the positive side of things. I have been through a lot in my 24 years on this earth and I became very good at hiding my emotions. I was also taught that feeling sorry for myself would not help in moving forward. With my current situation, it was very hard for me not to feel sorry for myself. Having lost my dad in the summer of 2012 and then seeing my baby like this, I’m surprised I did not lose my mind. With the help of my amazing support system, I somehow managed to hold it together during this two-month period of not knowing what would happen next. I have a very hard time not having a plan and until we knew more from the EUA, there was very little known about Jax's future. At this point, all we could do was dilate his left eye to help his pupil expand passed the clouded area on his cornea. When July 5th finally arrived, we were very nervous. We were nervous about our three-month-old going under anesthesia and how he would react to it, and we were nervous about what they saw when he was under anesthesia. After the exam, the doctors came in to discuss what they found. We were elated to find out that all of Jax's major structures behind the eye were perfect. They also told us that his cornea and his lens were not connected. It felt so good to finally get some good news. We were told our options of what to do next and we all decided that a cornea transplant was the way to go. This exam also showed that strands of Jax's iris were attached to his cornea. They were able to finally give us a name for his clinical condition, Peter's Anomaly. The transplant was scheduled for August 13th. 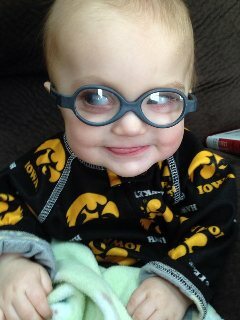 In between the EUA and the transplant, Jaxon got his first pair of glasses and boy did he look adorable! To get a baby’s prescription, they do a refraction test while the baby is under anesthesia. 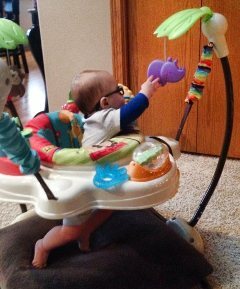 I wanted to show everyone how cute he was in his glasses, but we still hadn’t shared with the world that Jax had Peter’s Anomaly (PA). The big day finally came. It was the day of the transplant and we were all so nervous, but so excited at the same time. The procedure lasted a couple of hours and a nurse popped in to tell us everything was going great. It was such a relief to hear the doctor tell us that the transplant went very smoothly. This would turn out to be the easy part. Recovery would prove to be a lot of work for everyone, especially me. Taking care of Jax and giving him eye drops became my full time job. Not like an 8-5 full time job, but more like a 24/7 full time job. Jax had a hard time coming out of anesthesia after the transplant. His throat was also very irritated from the breathing tube and he sounded very hoarse. It was heartbreaking. We had to spend the night at the hospital that night which reminded us how hard the first 17 days of his life were while we stayed in the NICU. But, as always, I had my own entertainment. His name is Tyler. Tyler modeled for me in the 1,000-pound load bearing baby crib in Jax’s hospital room. The next morning we had a follow-up appointment. A clear eye shield replaced the brown bandage over Jax’s eye. He would have to wear this for the next 3 months. We also had to give him 17 eye drops a day. Meaning we would have to remove the shield every 4 hours, which meant peeling tape off of a baby's face every 4 hours. I'm sure you can imagine how fun this was! 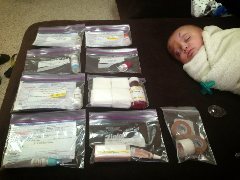 The next 3 months involved check-ups, EUA's, eye drops, tape, more tape, moving to be closer to the hospital and family, a very protective mommy, little mommy / daddy time, stress, paranoia, contacts, scares, etc. 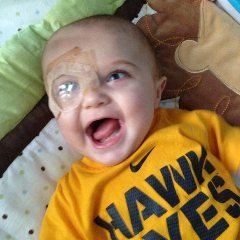 Jax developed an abrasion on the surface of his cornea during this time as well. This involved a contact lens that acted as a Band-Aid to help it heal. Every time it fell out we had to go back to Iowa City to have it put back in. They finally taught me how to put it back in and it usually involves a screaming baby, which breaks mommy's heart. Unfortunately this abrasion was right in the center of Jax’s pupil. This meant he wasn’t seeing out of this eye anymore. We believe this abrasion was caused by a viral infection. So, on top of 17 drops a day, Jax needed a dose of oral acyclovir four times a day. Thankfully, we are now on a maintenance dose of acyclovir so he only needs it two times a day. This is to prevent any future viral infections. Jax’s right eye also developed glaucoma. We have been able to control the pressure in his eye with eye drops thus far. If the eye drops stop working, he will have to have a shunt surgically implanted to reduce the intraocular pressure (or IOP). Thankfully, it has not come to that. 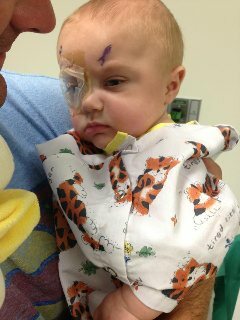 On November 8th, Jax had an EUA and got all of his sutures removed. FINALLY, NO MORE TAPE! 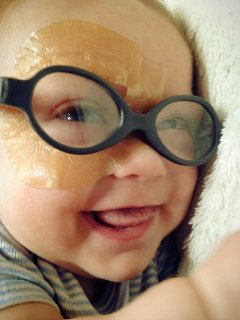 We would still have a lot of eye drops to do everyday, but this process is much easier when you don't have to peel tape off of his poor baby face. 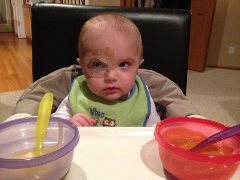 Because of the sutures, he was not allowed to rub or touch his eye. 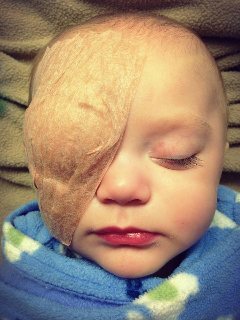 If he did rub his eye or get bumped by something, he could have ruptured a suture and caused damage to the transplant. So, if the shield was taken off, we could not take our eyes off of him. We had to be ready to stop him if we saw that he was about to rub it. This is why it was such a HUGE relief to get the sutures removed. It also made doing eye drops a lot easier and I could finally see his precious face without tape all over it. On December 6th, Jax had yet another EUA to get fitted for a new contact lens. We received some bad news after this one. His cornea was being rejected. His eye was injected with a steroid while he was under anesthesia. We won't know for about 6-8 weeks whether the injection reversed the rejection. We do know that he is seeing with his left eye though. He reaches for toys and smiles at our faces. Seeing him do this is like witnessing a tiny miracle day after day. 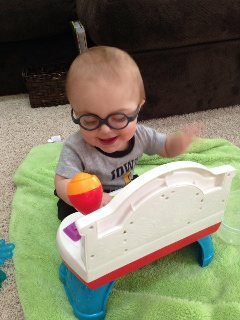 His visiting therapist, Jim, has evaluated Jax at reaching his milestones on the slow side of normal. This is amazing news to us because, like I said before, visually impaired kids are usually a few steps behind normal visioned kids. There is no way I could put into words how much this little boy has changed our lives during his short time on this Earth. He brings us so much joy every day and even though we hit bumps in the road, he always over comes them. I can't wait to see him grow and I know he will surprise everyone with his strength and ability to overcome the adversity he may face. We couldn't have gotten this far without our family, friends, and supporters. I also have to give a HUGE thanks to the doctors and nurses at the University of Iowa. They are absolutely amazing. We are not only impressed with their skills as doctors and nurses, but also with their confidence and ability to give comfort to us and the encouragement we need to stay optimistic and to tackle anything we may encounter. We legitimately look forward to seeing them at Jax's appointments. I know we are in the best hands we could possibly be in. To me, a superhero is a person who is greatly admired because of their bravery and strength. They have the special powers it takes to help others who find themselves in scary or unfamiliar situations, overcome the adversity that they face. Children and adults alike look up to them and aspire to have the bravery and strength that they do. This is why I created Captain Jax, because Jax is my superhero. Captain Jax doesn’t know it yet, but he has already impressed many with his bravery and strength. As he grows and faces more and more obstacles, Captain Jax has the potential to help inspire and teach other children and families to have the strength and bravery that it takes to get through the tough times. This may include surgery, patching, eye drops or hearing any news that you may have feared hearing. Support and encouragement is a crucial part to overcoming any adversity and we hope Captain Jax can provide these things, in one way or another, to anyone who needs it.